Epicoccum is a dematiaceous mitosporic mould widely distributed and commonly isolated from air, soil and foodstuff. It is found also in some animals and textiles. It is the common causative agent of leaf spots of various plants. The genus Epicoccum contains a single species, Epicoccum purpurascens. Epicoccum grows rapidly and produces woolly to cottony or felty colonies on potato dextrose agar at 25 degrees C. From the front, the colonies are yellow to orange, orange to red or pink initially and become greenish brown to black by aging. From the reverse, the same color is observed but is usually more intense than in the front view. Epicoccum may produce a diffusable pigment which turns the color of the inoculated medium to yellow, orange, red or brown. Black dots (100-2000 mm in diameter) may be observed macroscopically on the colony surface. These are the tufts of hyphae which have conidiophores on their surface. These tufts of hyphae are cushion-shaped and nonconvoluted and are called sporodochia. There are no documented cases of Epicoccum infection in humans or animals. Epicoccum is occasionally isolated from clinical samples. However, Epicoccum has not been documented as a pathogen and these isolates are considered as contaminants. contaminant / opportunistic pathogen, found in soil, air, water and rotting vegetation and can be commonly found in outdoor air. It is a common allergen, and rarely it can cause an infection in the skin. 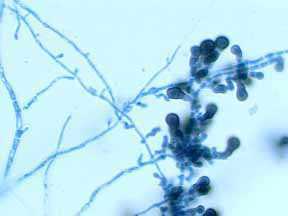 Mahgoub H. A., Prevalence of airborne Aspergillus flavus in Khartoum (Sudan) Aispora with BODYTEXT01ence to dusty weather and inoculum survival in simulated summer conditions. 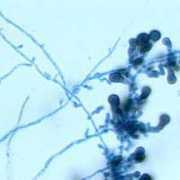 Mycopathologia 104 (1988) 137-141.